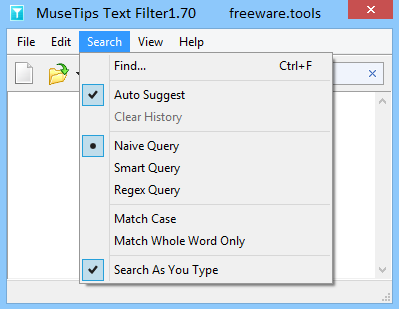 Muse Tips Text Filter is a basic text reader with the flexibility of real-time text search just as you type the words. All you need to do is open up a text file with Text Filter, and type the text you’re looking for in the search bar on top. The software will highlight the searched words, and will also show only those paragraphs that contain the search query results, thus making sorting through search results easier. There are a variety of search options available, which include auto suggestions (the software remembers your previous search queries), Regular Expression (Regex) support, case sensitivity etc, and also allows you to show or hide the matched words as per your choice. In case you habitually need to process large documents, then there is a good chance that you are looking for a tool that allows you to find the desired piece of information quick and painless. MuseTips Text Filter is a lightweight piece of software that enables you to effortlessly find any text or keyword within documents or other large chunks of texts. Following a quick and straightforward setup, you come face to face with an old-school and minimalistic interface that is unlikely to give you any troubles. In fact, the UI consists of two main sections, namely a large panel dedicated to the text you are processing and the search bar. It is worth mentioning that the utility displays the content you are looking for while you type, an option that can considerably speed up the query. As you would expect, the app provides auto-suggestions while you are writing, another feature that makes the search faster and easier. If you prefer to get more accurate results, then you can mark the Match Case or Match Whole Word Only options from the Search Menu. The program includes three search modules that can lend you a hand on various occasions. The Smart Query enables you to find results on word boundaries only, whereas the Naive Query allows you to look for content anywhere within the text. The Regex Query is particularly dedicated to large files and requires you uncheck the Search while you type option. Due to these reasons, the search can be noticeably slow. On the other hand, you should know that the utility does not include advanced search features, such as filters to look for keywords based on date or modifications, for instance. The function could surely come in handy when you are performing queries using frequently used keywords or key phrases. In the eventuality that you are new to document processing and would prefer an intuitive tool to help you speed up your workflow, then perhaps MuseTips Text Filter could come in handy.